There are few things more central to the American character than the right to petition government and the right to peaceably assemble. And there’s no better place to gather with like-minded individuals and make your voice heard than Washington, DC. 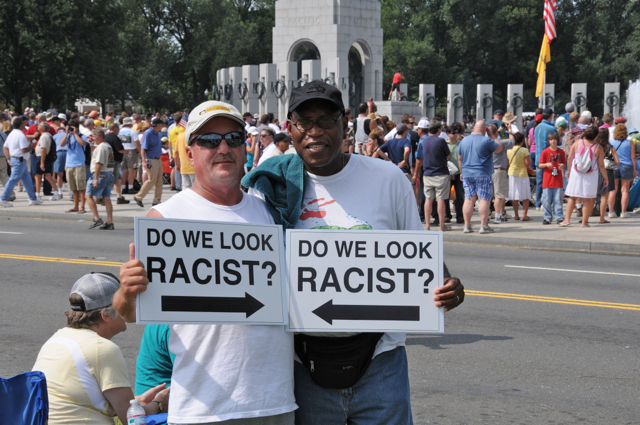 DC protests are iconic; think Martin Luther King Jr. standing on the steps of the Lincoln Memorial, the Million Man March on the National Mall, or Forrest Gump hugging Jenny in the Reflecting Pool in the middle of a Vietnam War protest. 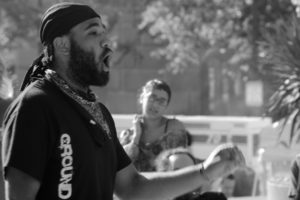 I have political beliefs but I have had great success, and a great time taking photos at events that range the political spectrum. I’ve photographed protests that range in size from a single person up to more than 200,000. 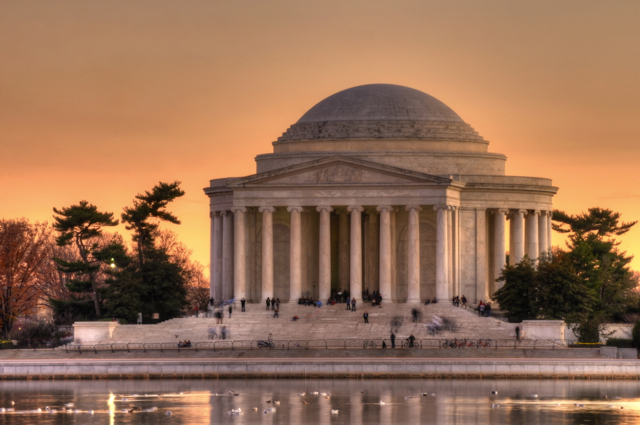 Capturing democracy in action is a great way to liven up your trip to DC. Below, I refer to rallies and protests interchangeably. To me, rallies are movements in favor of a cause whereas protests are movements against some cause. Either way their goal is change and that is what your photos should attempt to capture. 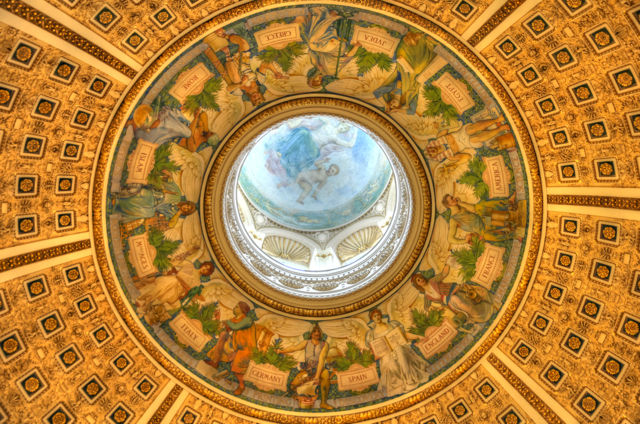 The nature and frequency of the protests correlate well with controversial legislation. 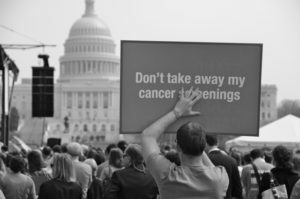 The Affordable Care Act (aka Obamacare) was passed before I moved to DC, but it inspired a number of passionate, surly protests. The Keystone XL Pipeline was a hot issue for several weeks around the time a decision needed to be made about moving ahead with the project. In my time in DC, nothing has brought out consistent protests (on both sides of the political spectrum) more than budgets, debt limit fights, and statehood for DC. With that said, protests can, and do, spring up almost anytime. Small organizations and single individuals protest just about every day. For example, the most bizarre, organized protest I’ve seen is a group of 3 or 4 people that protest circumcision. The problem is there is no public clearinghouse for when and where these protests will be held. Small protests of 20 or fewer people may be arranged via Twitter or a group’s website. So, for the majority of the day-to-day protests it’s a matter of going to the right places and seeing what’s going on. I talk about that more below. Larger protests, on the other hand, are arranged months in advance and are fairly well publicized. Permits have to be granted, port-o-potties have to be set up, and DC citizens have to be warned about traffic congestion. For these, large gatherings, reading the Washington Post or local blogs like DCist will give you some warning about upcoming opportunities. 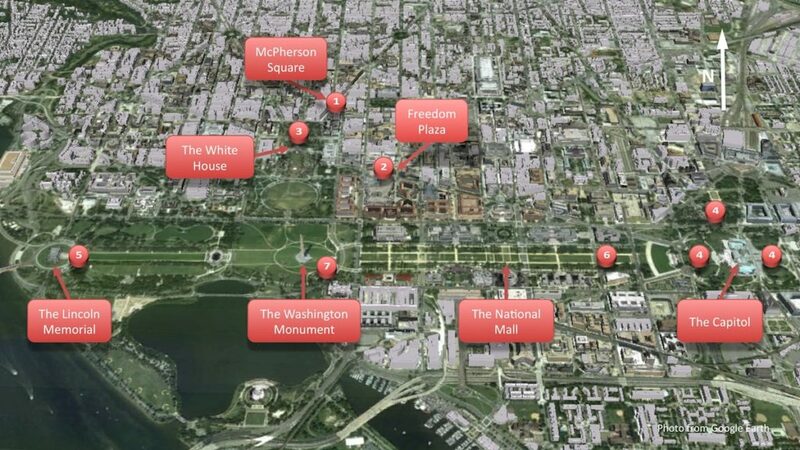 There are ongoing, Occupy DC protests at McPherson Square (1) and Freedom Plaza (2). 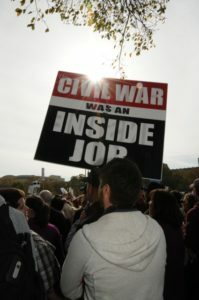 I’m not sure how long those will last but for now they are a reliable source for DC protest photos. Of these two locations I prefer Freedom Plaza. Outside of the Occupy protest the only other permanent protest I know of is in front of (on the North side of) the White House, in Lafayette Park (3). You’ll see a tent and some large signs set up protesting nuclear arms. For transient, temporary protests the best places to look are where the power is; the White House, the Capitol, and the Supreme Court. Around the White House the blocked off section of Pennsylvania Ave. between 15th and 17th St. (3) is the best place to find protestors. At the Capitol, the West, North, and East sides (4) are where the majority of the action takes place. You’ll also find crowds in the plaza on the West side of the Supreme Court when there are controversial cases being decided. 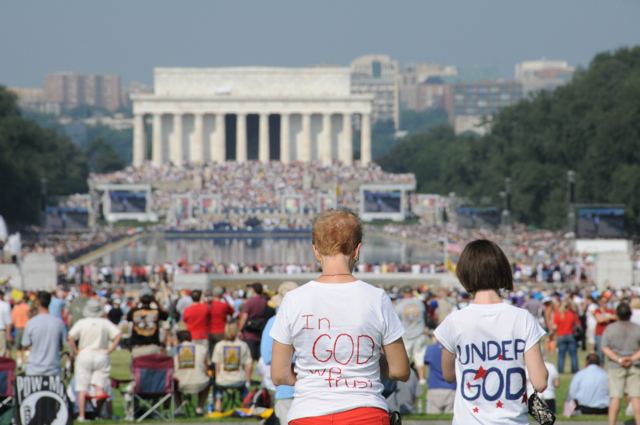 Large, organized protests of tens of thousands of people are held on the National Mall. For one thing, it’s the only place large enough to hold crowds of that size. Secondly, the people who arrange those events are media savvy and know that, if you’re going to bring in a crowd that size and have news outlets cover it, you should have a spectacular backdrop. So large protests will most often be held at either end of the National Mall, in front of the Lincoln Memorial (5) or the U.S. Capitol (6). There is also a stage and room for medium size events near the base of the Washington Monument (7). I am a very reluctant person/street photographer. In most circumstances I consider it rude to take photos of individual people, even in public places. I lose that inhibition at rallies and protests however, because people are the point. The people that show up to those events are there because they want to be seen. It is their presence that makes it a rally. So try to find individual people, or small groups, that illustrate what the protest is all about. There is no better way to do that than by including signs that express the group’s point of view and there’ll be no shortage of signs. 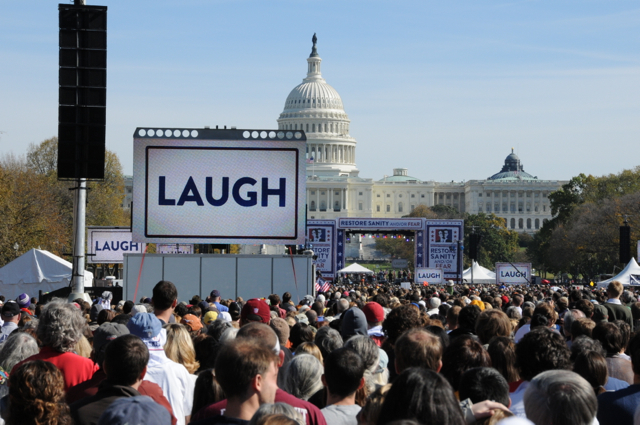 In the Fall of 2010, I went to the Rally to Restore Sanity and/or Fear that Jon Stewart and Stephen Colbert put on on the National Mall. One of the emphases of the rally was to bring humorous signs. A friend that I went with spent the majority of the time framing photos with just the signs. While she came back with some funny photos they didn’t really tell a story. I tried, as best I could, to include people along with the signs and to the extent possible include interesting background elements so that from front to back the picture was telling a story. 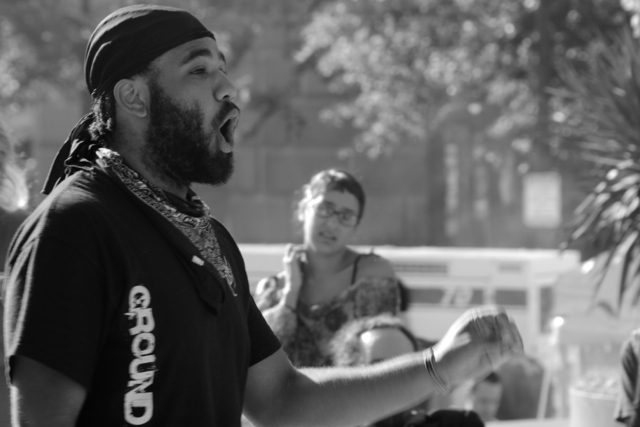 At some of the larger, more boisterous protests there can be a lot going on. You may be tempted to snap images to catch a lot of fleeting moments, but don’t forget composition. When possible, I like to frame my photos with a recognizable DC landmark in them, especially the Capitol or the White House. This locates your photo in space and allows the viewer to start constructing a narrative about what’s going on in the picture. Whenever there are large crowds (in the thousands) I like to get pictures that demonstrate the size of the group. If the group is densely packed you can use a wide-angle. If the group is dispersed you can use a longer focal length to compress the scene and give the illusion that it was more packed than it was. Either way, fill the frame with a sea of humanity. You would think this wouldn’t be a problem in this day-and-age but any crowd of more than 10,000 people on the National Mall will make your phone useless. There are just too many people for the network to support. This problem may vary by cell carrier and phone. I have an iPhone and AT&T and crowds in DC turn my phone into a paperweight. My advice is don’t plan on meeting someone, using your phone for navigation, or live-Tweeting at a protest. Meet up with your group away from the crowd and stick together while you’re there. Make plans of where to meet if you’re separated. What did we ever do before cell phones? Lens: You’ll find a wide range of photographic opportunities. Many will depend on the size of the protest and how comfortable you are with getting close to people you’re taking pictures of. The majority of your photos can be handled with an 18-55mm lens (for DX cameras), though some additional reach wouldn’t hurt. I use an 18-200mm kit lens and it works well. You won’t want to change lenses during large events so pick something that’s versatile. Tripod: You won’t need a tripod and you’ll find it to be a hindrance. Ninety-five percent of events take place during the middle of the day (10-4) so lighting shouldn’t be an issue. Flash: An external flash can help provide fill lighting when there is harsh, midday light. Bag: In many situations your bag size won’t matter. You don’t have to go through security so no one will tell you that you can’t come in. However, the larger the crowd, the more densely packed it will be. I wore a photo backpack to the Rally to Restore Sanity and found myself constantly bumping into people and being jostled around. I barely had room to stand upright, let alone to carry a lot of gear. So think about that before you head into the crowd. My Protest Pictures on Flickr – I couldn’t include all of the pictures I’ve taken of protests and rallies around DC in this blog post. If you’re looking for additional inspiration, you can find the rest on Flickr. 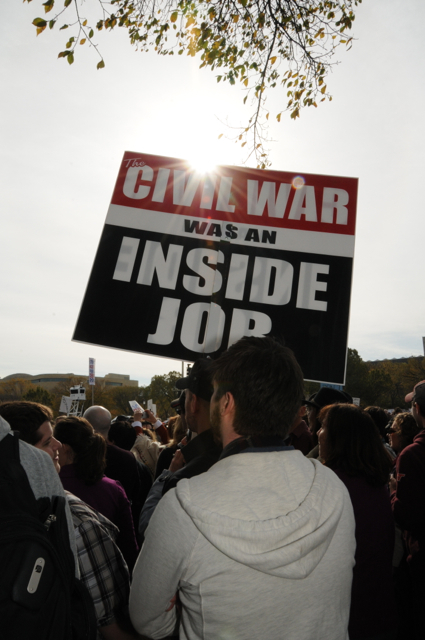 One Amazing Protest Photo – The best photo I’ve seen of a protest is this one from Philliefan99 at the Rally to Restore Sanity. It was taken from the top of the Washington Monument. Until the Monument reopens this isn’t a reasonable shot to hope for but keep it in the back of your mind as an idea.